The darkness of the past can paralyze the bravest warrior. Wisdom moves full-steam ahead and never looks back. Why dig up old skeletons and risk people judging? My doubt blares like a siren. Lord, don’t You remember the shameful moments riddling my past? Don’t You recall the poor decisions damaging, and sometimes destroying, relationships? What about the careless words I’ve spoken, the hurtful words of others that I can’t seem to forget? How can You use the painful things that happened to me, and the horrible things I’ve done, Lord? Fear and shame morph into an iron shield, separating me from people and from God. Still, the Holy Spirit breathes truth that eventually begins melting my steely heart. Dwelling in the past differs greatly from using the past to give God glory. 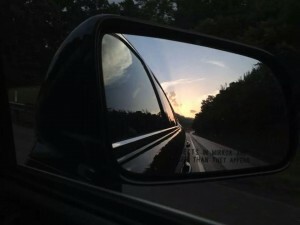 Like my friend realized when she snapped this picture, beauty pierces through the darkness we’re leaving behind. The unconditional love of the One who knows and wants to be known creates a powerful healing balm. In mercy, He turns heart-wrenching circumstances into testimonies of His faithfulness. Because God knows our purpose, we can thank Him for using hardships to reveal our great need for Him. Because God works for the good of all who love Him, we can appreciate the longsuffering that magnifies the truth of His power made perfect in our weakness. Because God redeems, we can share our story and point to His power and grace. Faith roots deep when watered by witnesses of God’s faithfulness in our lives, in the lives of others, and in the Bible. Every child of God is a living testimony of His life-transforming grace. His Light pierces through the dark parts of our past and uses our story to shine hope into the lives of others. What has God done for you in the past that can refresh your faith or shine hope into a friend’s dark situation? What’s stopping you from sharing your testimony and giving God glory for what He’s done? If you’ve shared your testimony, how have you and others been blessed by your courage to be transparent and honest about your past struggles? Photo taken by Cheryl Thompson and used with permission. Portions of this article previously published at www.xedixon.com, June 2014 and at FBCVV.com January 2015. This entry was posted in Encouragement and tagged Spiritual Growth, Trusting God by Xochi E. Dixon. Bookmark the permalink. Encouraging words and lots of wisdom here. God has done so many things in my life, they wouldn’t fit here. Thank you for reminding us to use our past to refresh our faith for the present and future. We are so forgetful. God is so faithful. Cendy, I love your passion for loving God and people, as you share His truth with contagious joy and grateful praise. I pray He will bless you with many more opportunities to share your ongoing testimony of faith. I thank God for your partnership in spreading the Good News with love and grace, in the special ways God has created us to do His work, always in His power and for His glory. Hallelujah!